I hadn’t really planned on doing NaNo this year. I love the idea, and I’m the kind of person who works well under a deadline. Having the goal and the time limit in which to complete it really helps propel me. I haven’t always completed it, but I’ve come close or competed at least one of the goals I set out for myself. This year, though, I knew November was going to be a tough month. I have multiple commitments scheduled for every weekend, plus my various “day jobs,” including but not limited to my work at Splickety and babysitting four extra kids three mornings a week. I still wanted to participate, but I didn’t have a story plot in mind, and I didn’t really have a lot of motivation, so I was going back and forth on whether or not to do it at all. Then, I talked with a friend and started plotstorming and articulating the half-baked idea I had swirling around amid all the other mush up inside my head, and I really liked what started to come together. There’s a story here I can be passionate about, something I can really get into and make into a really fascinating story. Except, November has fallen out more or less as I predicted. All the busyness I knew I had planned has been as bad as I thought it would be and worse. And more things keep getting added to my plate. As soon as I think I’ve got something under control, something else comes up and makes things that much harder, complications including but not limited to a dear friend moving, being sick, and having ants invade my house again. And so, sadly, NaNo has necessarily taken a back seat to all the other necessary and urgent things on my to-do list. I’m so far behind at this point there’s no possible way I can catch up and make the goal. That doesn’t mean I’m not going to write (when I can), but it does mean I’m not going to feel guilty about giving up on the NaNo goal while I juggle everything else. Yeah, that happened to me a couple of years. It’s good to know your priorities and to be unashamed about following them. 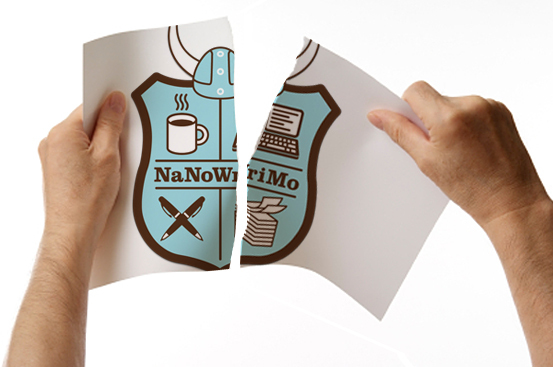 Sometimes, NaNoWriMo has to take a back seat, and that’s okay! Don’t think of it as a fail. Think of it as investing your time elsewhere. You are right to not feel guilty about it. You know where your priorities are. That’s how I feel. It just isn’t a priority this year.